It’s no secret that we love pizza! I also love spinach. 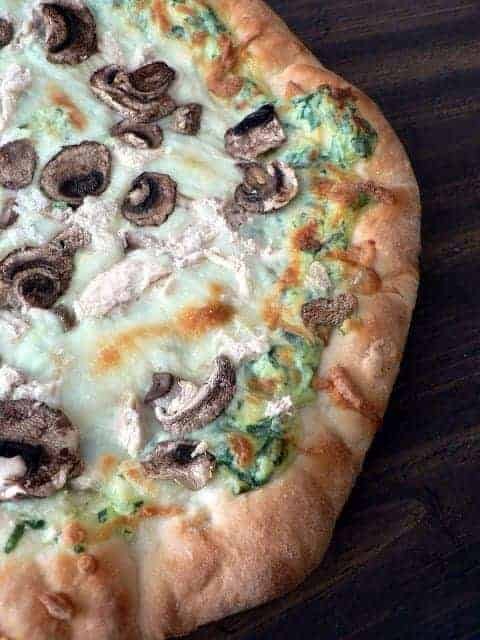 I was pondering how to mix the two when I had a vision of chicken Alfredo pizza with spinach hiding in the creamy Alfredo sauce! It turned out amazing. Husband told me more than once it was “the best pizza ever”. He might have been extra hungry that night so it tasted especially good; it was pretty fantastic in my opinion, too, though! I doubled the sauce as written which left me with enough for 2 pizzas, dipping sauce for breadsticks, and enough to pour over a pound of hot cooked pasta with some grated Parmesan on top another night! I also doubled the dough and made 2 pizzas, bread sticks, and cinnamon sticks! A whole meal with lots of leftovers. 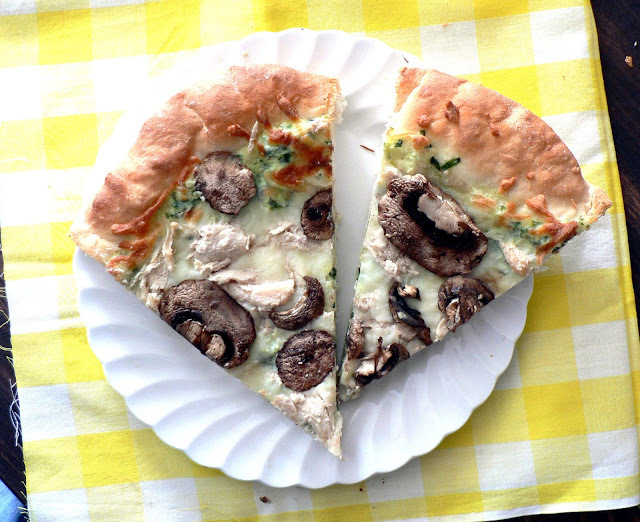 Take your homemade pizza to new heights with this homemade pizza featuring chicken, bacon and mushrooms slathered in melted cheese and creamy sauce. In a large mixing bowl add the water, yeast, sugar, salt, and olive oil. Allow mixture to stand for 5 minutes. Add one cup of flour and mix to combine. Add another cup of flour and mix through. Mix for 1 or 2 minutes. The dough should be the consistency of cake batter. Add another cup of flour and mix through. Add flour until you can’t mix it by hand very well. Sprinkle some flour on your table and turn the dough onto the table. 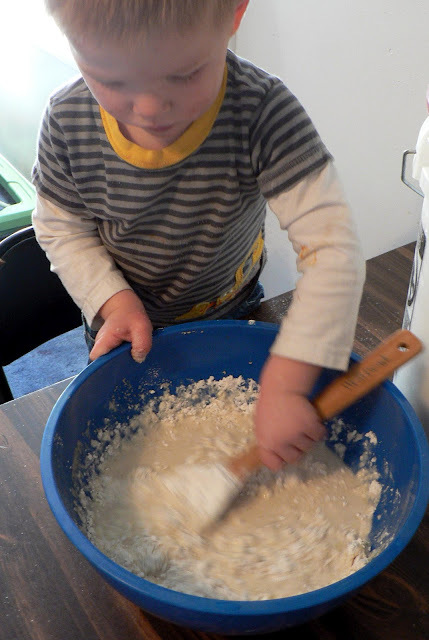 Knead the dough by hand until it is smooth and elastic, adding flour as needed. This should take 6-10 minutes of kneading. Place the dough back in the bowl, cover it with a towel, and let it rise in a warm place for 15-60 minutes (this time varies a lot for me, I just let it rise according to how long it is until dinner time). 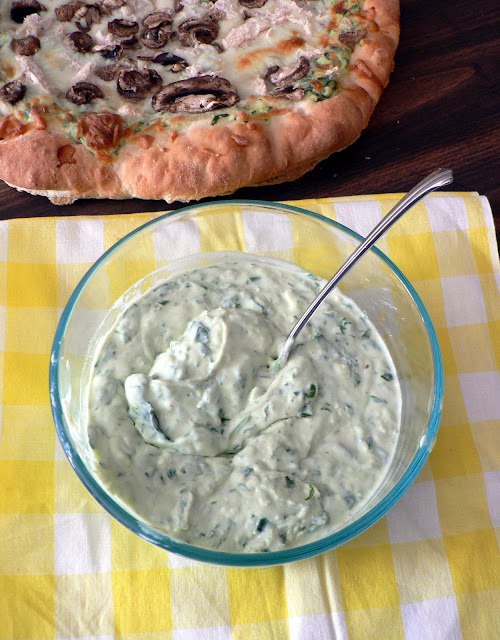 While the dough is rising, make the creamy spinach sauce. Recipe follows. Preheat oven to 375 degrees. Divide the dough in half. 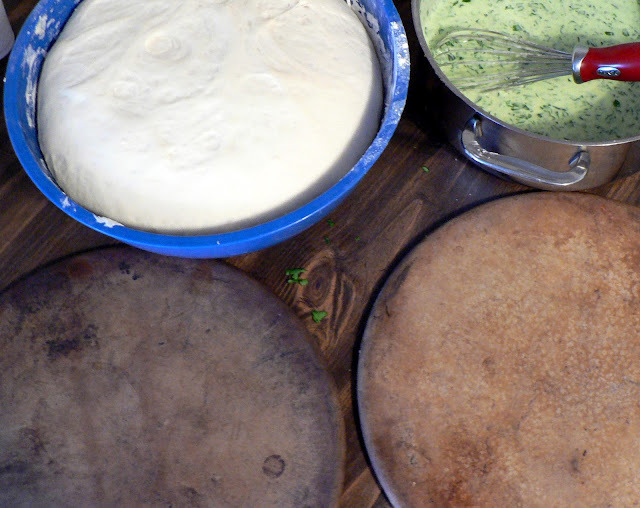 Roll half of the dough out on a pizza stone. Bake for 10 minutes. Roll out the other half of the dough on another stone while the first is baking. After the 10 minutes, switch the dough. Bake the second dough for 10 minutes too. 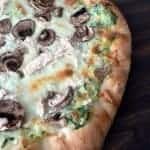 After you have prebaked the crust, top with about a cup of the creamy spinach sauce and half of the cheese, chicken, mushrooms, and bacon. Bake for another 15-20 minutes until the cheese is bubbly and the edges start to brown. Repeat with the second pizza. In a medium sauce pan let the butter melt over medium heat. When it is all melted add the flour and stir to combine. Allow the mixture to cook for around a minute, stirring occasionally. Add the minced garlic and cook until fragrant. Add 1 cup of the milk a little at a time while whisking to combine. 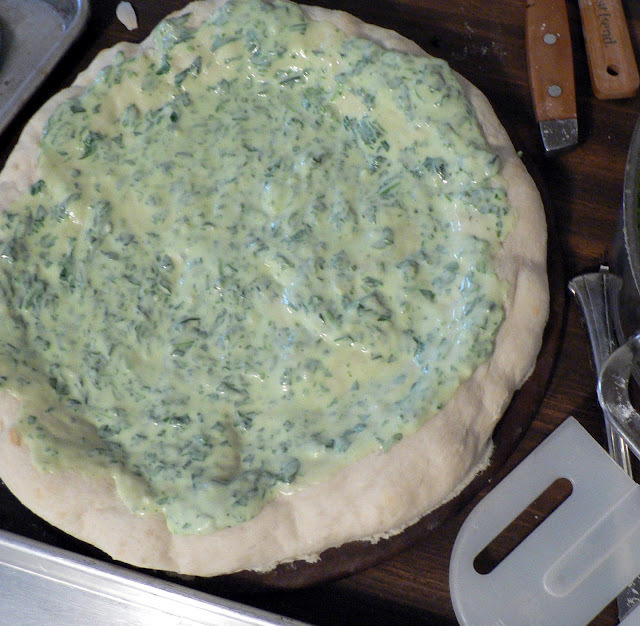 Add the cream cheese, salt, pepper, and spinach to the hot milk mixture. Stir frequently. The mixture will thicken as it cooks. If it is too thick add a splash or two of milk. Cook for 5 minutes. At the end of the 5 minutes the mixture should be the consistency of a typical Alfredo sauce if not a little thicker. Add milk if it is too thick. Take off the heat and allow to cool slightly. Taste for salt and add more if needed. Melissa – I love this site. LOVE. And I’m pretty sure I’m going to die from the awesomeness of this recipe. And I pinned it. 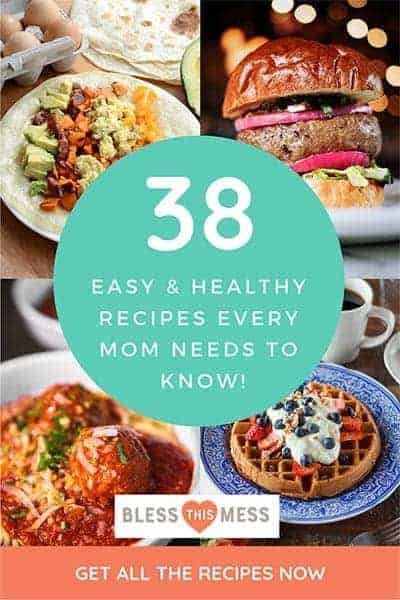 I hope scores of readers see it and want it and then follow your blog. THANK YOU! I love that you love it! 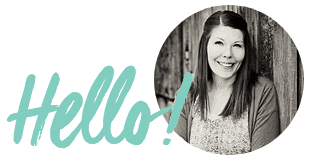 It’s so rewarding to know all this fun work isn’t just out in blogosphere with no one reading. Let me know how the pizza turns out! May did pitch a fit about the pizza. She didn’t want to try it. She picked off the mushrooms (which I gobbled up) and finally tried it and then loved it. Everyone else loved it with out the fit 🙂 . Question: Does the recipe as-is make two whole pizzas, or were you saying in the beginning that you doubled the recipe listed to make 2 pizzas? I want to try this with one pizza, so I’m just wanting to make sure I halve the recipe requirements if this actually makes 2 pizzas, thanks! It makes 2 pizzas! That was a little confusing huh! Enjoy Lauren! I made this again last night, but used broccoli instead of spinach. SO GOOD! !